One hundred and fifty-nine international observers will monitor Sunday's by-election in Burma, Tin Aye, the head of the country's Union Election Commission, told journalists in Naypyidaw on Wednesday. The observers include diplomats from Rangoon-based embassies, and election specialists from Asian countries, European Union nations and the US. Those not living in Burma began arriving in the country on Wednesday, according to journalists in Rangoon. Tin Aye said that the Election Commission will announce the results of the April 1 election within one week. However, he said, the election commissions at township and district levels will announce the results of the polls immediately after ballots are counted. Talking to reporters at his office in Naypyidaw, Tin Aye vowed the government would ensure a free and fair election, and said cheating would not be tolerated under his administration. He said that the Election Commission had decided to suspend polling in three constituencies in Kachin State due to security reasons. Armed conflict between government troops and the Kachin Independence Army has been ongoing since June 2011. The April 1 by-election is being held to fill 48 parliamentary seats vacated by lawmakers who were appointed to the Cabinet and other posts. Burma’s pro-democracy icon Aung San Suu Kyi, who leads the main opposition National League for Democracy, is contesting a seat in Kawhmu. 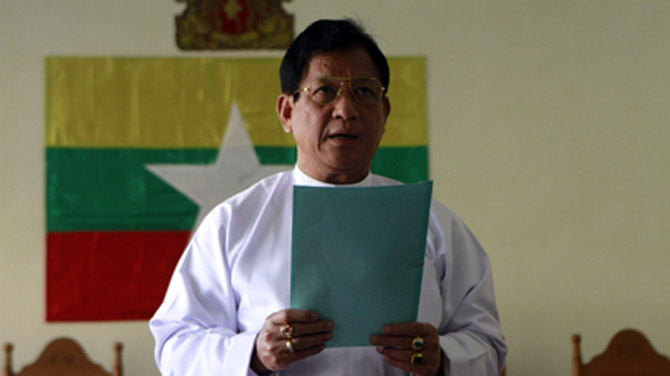 On March 20, Burma invited the Association of Southeast Asian Nations to send a five-member election delegation along with more than two dozen parliamentarians and media representatives. The invitation, however, was extended on March 21 to include the United States and EU. India will also send two election observers and Japan will send three observers to monitor the polls. On March 20, a veteran election monitor, Somsri Hananuntasuk, the the head of the Asian Network for Free Elections was deported by Burmese immigration officials after they accused her of participating in a seminar while in the country on a tourist visa. The 159 accredited observers will have access to any of the more than 8,000 polling stations which will be open on Sunday from 6 am to 4 pm. Contesting parties can also nominate their own observers to monitor the polls and the ballot-counting process at each polling station. "WAIT and SEE Policy".....This mini fake rain will not yield anything to benefit the people of Burma who are in need. Dead peoples name from the electoral list is still have or not who knows? Many name are listed repeatedly different consituency, why like this? How Election commission will take action all complaints and when? Welcome delegation from abroad to decide election is fare and square.